The Derny is very famous in France. 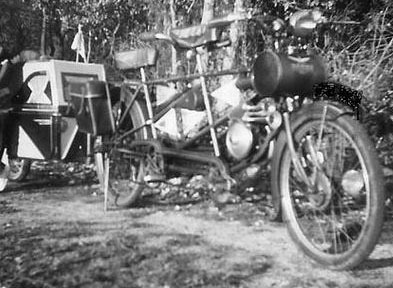 Its design has hardly changed from that of the earliest motorcycles – essentially a bicycle with an engine attached. It’s front-mounted petrol tank is particularly distinctive. 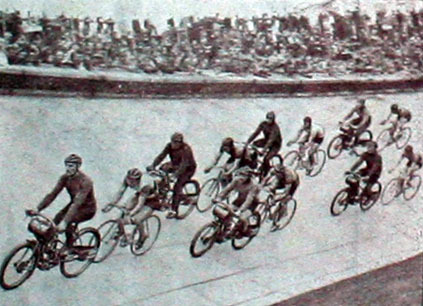 The solo Derny illustrated below is the machine used for cycle pacing, and its design did not change throughout its production. The one below is waiting to visit our workshops for restoration and resale. By 1953, Derny were looking for ways to sell in an increasingly competitive market. They totally redesigned their cyclotandem and fitted a Sachs engine to create a new model. 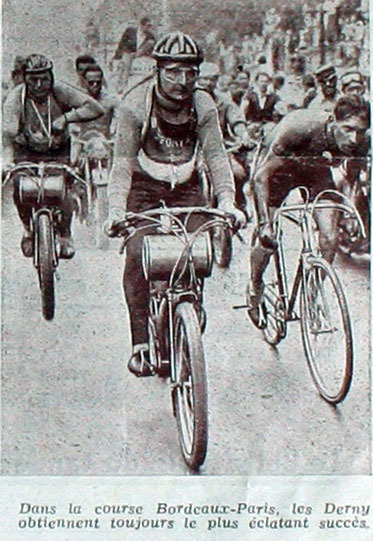 But motorized tandems were soon to become an anachronism. These ungainly ‘white elephants’ had no real advantage over a motorcycle, apart from being pedal start so that they escaped tax and the need for a license. Of course, half a century later we adore ungainly white elephants …and the Derny Tandem Grand Tourisme is such a classic example of 1930s French motorcycle excess that it is admired wherever you ride it. It’s very rare to find a Cyclotandem Derny featuring this accessory (below). As you can see further down the page, this bag only fitted this particular model, which had the engine underneath the passenger seat (while the Zurcher engine on all the other Derny models was fitted at the front, under the driver’s seat). Compare this model, manufactured only in 1953, with the earlier model (below).